Objectives To assess the prognostic value of hyponatraemia, hyperglycaemia and impaired estimated glomerular filtration rate (eGFR) in predicting in-hospital death in patients with acute heart failure (AHF) admitted for acute dyspnoea in the emergency department. Setting Emergency Department of the University Hospital of Nancy. Data were collected from August 2013 to October 2015. Participants The analysis included 405 patients with AHF admitted for acute dyspnoea in an emergency department. Results The population was elderly (mean age 82 years), 20.1% had hyponatraemia, 45.1% had hyperglycaemia and 48.6% had eGFR <50 mL/min/1.73 m2. Sixty-one patients (15.1%) died in hospital, mostly due to cardiac aetiology (58.3%). In multivariable analysis adjusted for key potential confounders, adjusted hyponatraemia (OR=2.40, (1.16 to 4.98), p=0.02), hyperglycaemia (OR=2.00, 1.06 to 3.76, p=0.03) and eGFR <50 mL/min/1.73 m2 (OR=1.97 (1.00 to 3.80), p=0.04*) were all identified as significant independent predictors of in-hospital death. Conclusions Results of basic routine laboratory tests (hyponatraemia, hyperglycaemia and impaired eGFR) performed on admission in the emergency department are independently associated with in-hospital death. These inexpensive tests, performed as early as patient admission in the emergency department, could allow the early identification of patients admitted for AHF who are at high risk of in-hospital death. This study focuses on simple biomarkers readily available in the emergency department. Given that our study had broad inclusion criteria and that all patients having these criteria could be exported from electronic patient files, our data represent a fair reflection of the clinical practice of large emergency centres in France. The retrospective design of this study is a limitation and the absence of residual confounding cannot be ascertained. Out-of-hospital mortality was not available. Brain natriuretic peptide was not available in all patients. A number of tools have been developed to assess risk at an early stage during AHF hospitalisation, including clinical findings, imaging and biological factors. However, these risk-stratifying tools have been primarily derived from populations with isolated AHF included in cardiology units. As a result, the prognosis factors relevant to an unselected population of patients with AHF, with either isolated AHF or AHF associated with coexisting causes of acute dyspnoea, have been sparsely assessed. Simple biomarkers such as hyponatraemia, hyperglycaemia and renal dysfunction have been shown to be associated with short-term prognosis in patients admitted in cardiology units for AHF.8–10 Hyponatraemia is the most common electrolyte abnormality in patients hospitalised with AHF11 with a prevalence of 19%–25%. Notwithstanding, the importance of assessing patient prognosis at ED admission for AHF remains paramount. As suggested above, most studies have investigated this biomarker in an in-hospital setting, However, the prognostic factor of these markers in the ED, within hours of admission, in patients with suspected AHF, has been insufficiently studied. In light of the above, the present study assessed the predictive value of hyponatraemia, hyperglycaemia and renal function at first blood sample in patients admitted in the ED for acute dyspnoea due to AHF. The ‘Pathway of dyspneic patients in Emergency’ (PARADISE) cohort (NCT02800122) was constituted from the hospital’s electronic database which was used to search for the records of all patients fulfilling the required characteristics of the study population. Inclusion criteria consisted of all patients with acute dyspnoea aged 18 year or older admitted in the academic ED of the Nancy University Hospital (France) over a 27-month period from 1 August 2013 to 31 October 2015. 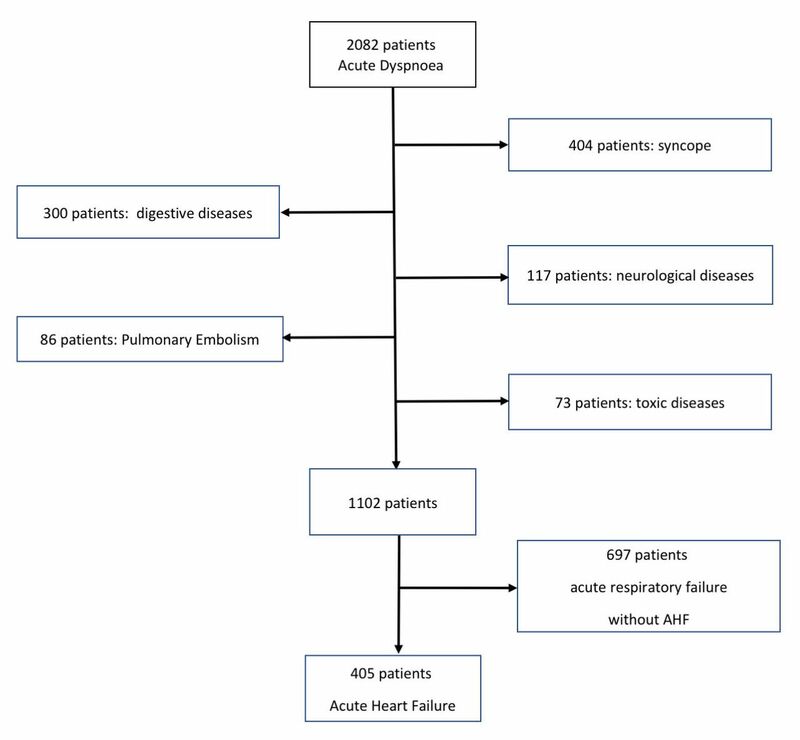 Among the 2082 patients with acute dyspnoea admitted over the studied time period, 405 patients (19.5%) were considered as having AHF as the sole or associated cause of admission in the ED (figure 1). The diagnosis was retrieved from the patients’ medical report with final diagnosis at hospital discharge according to the International Classification Diseases code (I.50.0, I50.1, I50.9 and J81). Flow chart. AHF, acute heart failure. Medical history, clinical parameters, laboratory results, treatment received in the ED and in-hospital outcome were retrieved from the patients’ medical record. In keeping with data protection requirements, the PARADISE cohort was approved by the Commission d’Informatique et Libertés under number: R2016-08. The determinations of natraemia, glucose and creatinine concentrations by ion selective electrodes and enzymatic methods were performed on Beckman Coulter AU Clinical Chemistry analyzers. Natraemia was corrected for blood glucose using the following formula: corrected serum sodium (mmol/L)=measured serum sodium−1.6(1−blood glucose (g/L)). Estimated glomerular filtration rate (eGFR) was calculated using the MDRD formulas. To account for diabetic status, as used by others,12 hyperglycaemia was defined as a blood glucose >1.26 g/L for diabetes-free patients and >1.8 g/L for patients with diabetes. Brain natriuretic peptide (BNP) and/or troponin were measured at the time of emergency management. Chest X-rays were interpreted by emergency ward physicians, and were coded as follows: normal, pulmonary infection, heart failure (including pleural effusion) and both infection and heart failure. Continuous variables are presented as mean and SD; categorical variables are presented as numbers and percentage of patients. The continuous variables were analysed using Student’s t-test, while comparisons between categorical variables were performed with the χ2 test or Fisher’s exact test as appropriate. Associations of biological variables with in-hospital death were derived from univariable and multivariable logistic regression. Models of increasing complexity were used. Adjustment variables, a priori selected on clinical relevance (as previously used by our group),13 included biological variables (natraemia, blood glucose and eGFR—in models in which the variable was not the primary exposure variable), age, systolic blood pressure (SBP), diabetes and BNP. The reported p values are two-sided and a p value of <0.05 was considered to indicate statistical significance. Statistical analyses were performed using SAS/STAT software, V.9.4 of the SAS System for Windows. Overall, the population was elderly (mean age 82.1±10.7 years), predominantly woman (60.7%), with a high proportion of comorbidities. More than one-third of patients were admitted in intensive care units (ICUs). SBP was mainly in the hypertensive range (145.6±32.2 mm Hg). A majority of patients had an eGFR ≥50 mL/min/1.73m2 (50.8%) whereas a corrected natraemia level <136 mmol/L was observed in 21.5% and a high blood glucose level in 43.9% (table 1). In-hospital mortality rate was 15.1% (n=61). Detailed characteristics according to natraemia, hyperglycaemia and eGFR status are presented in table 1. There were no stringent differences between the groups with normal and abnormal laboratory values except for SBP, which was lower in patients with natraemia <136 and eGFR <50, but higher in patients with hyperglycaemia. BNP levels were similar across all groups except for higher BNP values in patients with eGFR >50. Patients with natraemia <136 mmol/L had a much higher mortality rate than patients with normonatraemia (24.1% vs 12.6%, p=0.01*). In univariable analysis, hyponatraemia was significantly associated with in-hospital mortality (OR=2.61, (1.40 to 4.85), p<0.01*) whereas eGFR <50 mL/min/1.73m2 (OR=1.65, (0.95 to 2.88), p=0.08) and hyperglycaemia (OR=1.56, (0.90 to 2.72), p=0.12) were not associated with outcome (table 2). After adjustment for potential confounders (age, SBP, diabetes and BNP) and other routine laboratory variables, hyponatraemia (OR=2.40, (1.16 to 4.98), p=0.02*), hyperglycaemia (OR=2.00, (1.06 to 3.76), p=0.02*) and eGFR <50 mL/min/1.73m2 (OR=1.97, (1.00 to 3.80), p=0.04*) were all significantly associated with a two-fold increase in the risk of in-hospital mortality (table 2). Importantly, the association between hyperglycaemia and outcome was not dependent on diabetic status (p for interaction between diabetic status and hyperglycaemia=0.61). The main findings of this study are that routine laboratory tests such as hyponatraemia, hyperglycaemia and reduced eGFR are strong and independent predictors of in-hospital mortality in the specific setting of patients with AHF admitted for acute dyspnoea in the ED. Altered cardiac function triggers extrinsic and intrinsic mechanisms aimed at maintaining adequate cardiac output. One such mechanism is peripheral adaptation. Indeed, decreased cardiac output leads to neurohumoral system (rennin–angiotensin–aldosterone and arginine vasopressin (AVP)) activation in order to preserve plasma volume and maintain organ perfusion pressure. Such activation represents one of the major characteristics of heart failure and can be deleterious in the long term. Angiotensin II is a very powerful vasoconstrictor which additionally induces, via aldosterone, substantial hydro-sodium retention. AVP is a powerful vasoconstrictor that also features antidiuretic properties that can ultimately promote fluid retention and hyponatraemia. AVP is stimulated at the final heart failure stage. It is therefore possible to interpret hyponatraemia as a neurohumoral activation marker of advanced heart failure. Our study results confirm that hyponatraemia, measured as early as the first blood sample, is a risk factor for in-hospital mortality. It is thus important, at the ED, to detect the hyponatraemia in patients admitted with acute AHF. Cardiorenal syndrome results in kidney damage associated with renal dysfunction. According to the definition, the incidence of worsening renal function during AHF is 20%–30%. Systemic congestion is an important predictor of worsening renal function during AHF. Kidney function degrades through several mechanisms (reduced renal blood flow, renal hypoxia, increased interstitial pressure and renal interstitial fibrosis) and represents an independent risk factor during AHF. Independently of the definition used, worsening renal function is common in patients admitted for AHF in the emergency room. In the DefSSICA study, a prospective survey conducted in 26 EDs in France, nearly 30% of the patients admitted for AHF presented renal impairment (median eGFR=50 (35–69) mL/min/1.73 m2), whereas patients without AHF had better renal function (median eGFR=65 (42–92) mL/min/1.73 m2, p<0.001). The occurrence of worsening renal function has been associated with an increased risk of hospital readmission and both in-hospital and postdischarge mortality. Such condition hence warrants close monitoring from the first emergency contact onward. In our cohort, natraemia <136 mmol/L was found to be frequent (20.1%) in patients with AHF admitted for acute dyspnoea and associated with a two-fold increase in the risk of in-hospital mortality (OR=2.40, (1.16 to 4.98]) p=0.02*). Several studies have investigated this electrolyte balance disorder in the setting of cardiology wards in patients with typically isolated AHF.14–16 In these previous reports, hyponatraemia was similarly common (19%–25%) in patients with isolated AHF17 and associated with a higher risk of short-term and medium-term mortality (6.0% CI 95% (5.5 to 6.5 vs 3.2% (3.0 to 3.4), p<0.0001% and 12.4% CI 95% (10.0 to 14.9) vs 7.6% (6.2 to 8.1), p<0.0001), respectively in the OPTIMIZE-HF study.18 Compared with this previously reported population, the present population was much older (82 vs 73 years old) and had a much higher mortality rate (in-hospital mortality 15.1% vs <4% in OPTIMIZE-HF). Despite this much greater risk profile, natraemia <136 remained strongly and independently associated with mortality and thus highly relevant in the setting of patients with acute dyspnoea admitted in the ED. An eGFR <50 mL/min/1.73m2 was also found to be a significant predictor of in-hospital death (OR=1.97, (1.00 to 3.80), p=0.04). Previous reports showed that worsening renal function during diuretic, ACE inhibitor or vasodilator therapy was not a strong predictor of adverse mid-term outcome.19 Worsening renal function is often a common accompanying feature of decongestion,20 with certain metrics of decongestion such as haemoconcentration being protective in the setting of AHF.21 The present study highlights a strong association between admission eGFR <50 mL/min/1.73m2 and in-hospital mortality. This finding reinforces the strong prognostic value of admission renal function for very short-term outcome, likely due to the difficulty in treating congestion in patients with impaired renal function.22 Importantly, the use of dialysis may be hampered in elderly patients with aggravating renal function during the course of hospital stay, which could partly explain this strong association with adverse outcome. Hyperglycaemia was similarly found to be an independent predictor of in-hospital death in our population of patients with AHF admitted for acute dyspnoea (OR=2, (1.06 to 3.76), p=0.03). Several studies have shown that hyperglycaemia is a prognostic factor in AHF, even in patients admitted for AHF in the ED.12 23 24 Our results are thoroughly in keeping with the report of Mebazaa et al which showed a significant and independent association between hyperglycaemia and short-term mortality at 30 days (OR=2.19, CI 95% (1.69 to 2.83) p<0.001).12 Kattel et al furthermore showed that hyperglycaemia also had an impact on long-term prognosis (ie, 1.8 years).25 The present findings further demonstrate that hyperglycaemia also has a significant prognostic impact on very early outcome such as in-hospital death. The prognostic value of blood glucose levels, natraemia and renal function has already been shown in other studies, although mainly in patients with usually isolated AHF, with or without acute dyspnoea, and primarily in cardiology units. Similarly, most predictive scores have stemmed from patients admitted to cardiology units and have assessed various associations with mild to long-term outcome.26 Importantly, the only AHF in-hospital mortality risk score developed in the ED, namely the Emergency Heart Failure Mortality Risk Grade (EHMRG) score, included creatinine (but not eGFR) and furthermore did not consider natraemia or blood glucose.27 To our knowledge, the present study is the first joint analysis of routine laboratory tests to include eGFR, natraemia and blood glucose in the very specific setting of acute dyspnoea in patients with AHF admitted to the ER. Assessment of natriuretic peptides (NP) is particularly relevant in AHF,29 as demonstrated in the PRIDE study which showed that NP was superior to clinical evaluation for risk stratification.30 Importantly, we provide evidence for the strong and independent association of eGFR, natraemia and blood glucose even when adjusting for BNP values. Several other biomarkers have been shown to be useful prognostic factors, including troponin levels.31 However, these latter biomarkers are not currently used in all patients admitted for acute dyspnoea, whereas the basic laboratory tests targeted herein are available in virtually all patients admitted in the ED. In addition, BNP and troponin results are usually delivered several hours after admission whereas usual laboratory workup is typically delivered within 1 hour of admission. As a result, using these routine test results could allow for a faster risk stratification of patients with AHF admitted for acute dyspnoea, and could guide toward rapid admission to a specialised medical unit such as an ICU or cardiac care unit. The main limitations of this study are that, given its limited sample size and single-centre retrospective nature, the present results require external validation. Nevertheless, our study would appear of key interest for such external validation and suggests that routine laboratory tests may represent valuable candidate variables for future risk-stratifying tools dedicated to patients with AHF admitted in the ED. Second, literature has already shown that there is a ‘weekend effect’ for patients admitted to ED on weekends and public holidays versus those admitted on other days.32 Unfortunately, such information is not available is our dataset. Third, we did not have information regarding hospital length of stay, which could have been an adjustment factor. However, this limitation is not of key importance in our analysis since only the single and first value at admission to the ED was considered and not an analysis of the variation at various times during hospital stay. Our study highlights the strong association of hyponatraemia, hyperglycaemia and renal dysfunction at admission in patients with AHF admitted in the ED for acute dyspnoea. These routine laboratory results should hence not be overlooked as risk-stratifying tools in this specific population remain to be constructed and validated. We thank Pierre Pothier for editing the manuscript and Pierre Edouard Bollaert for providing expert advice.
. on behalf of IN-HF Outcom Investigators. Prognostic impact of in-hospital hyperglycemia in hospitalized patients with acute heart failure: Results of the IN-HF (Italian Network on Heart Failure) Outcome registry. International Journal of Cardiology 2016;206:587–93.
. Prognostic value of residual pulmonary congestion at discharge assessed by lung ultrasound imaging in heart failure: Prognostic value of B-lines after discharge from HF hospitalisation. European Journal of Heart Failure 2015;17:1172–81.
. Impact of haemoconcentration during acute heart failure therapy on mortality and its relationship with worsening renal function: Haemoconcentration during acute heart failure therapy. European Journal of Heart Failure 2017;19:226–36.
. ADHERE Scientific Advisory Committee and Investigators. Admission B-type natriuretic peptide levels and in-hospital mortality in acute decompensated heart failure. J Am Coll Cardiol 2007;49:1943–50. Contributors TC, ABu, ABa, DJ, PR, FZ and NG drafted the manuscript for important intellectual content. LN provided the study clinical data. ABu and JMV coordinated the data management and performed the data analysis. FB and SS coordinated the biological analysis dataset. All authors read and approved the final manuscript. Funding Results incorporated in this article received funding from the Investments for the Future program under grant agreement No ANR-15-RHU-0004. Competing interests TC and NG have received Board Membership Fees from Novartis. PR received fees from Relypsa. FZ has received fees for serving on the board of Boston Scientific; consulting fees from Novartis, Takeda, AstraZeneca, Boehringer Ingelheim, GE Healthcare, Relypsa, Servier, Boston Scientific, Bayer, Johnson and Johnson, and Resmed; and speakers’ fees from Pfizer and AstraZeneca. FZ and PR are co-founders of CardioRenal diagnostics. Ethics approval In keeping with data protection requirements, the PARADISE "Pathway of dyspneic patients in Emergency" cohort was approved by the Commission d’Informatique et Libertés (CIL) under number: R2016-08.